You are here: Home › Stayfitcentral Health & Fitness Blog › Health & Fitness Blog › Workouts › Weight Loss Workouts › Hill Sprints – The Best Way To Burn Fat Fast! Hill Sprints – The Best Way To Burn Fat Fast! Forget about using a elliptical machine, Stairmaster, or treadmill to lose fat get into shape. Jogging is out too. The best way to get into lose fat fast and get into world class shape are hill sprints. They’re brutally hard and equally demanding but the results are worth the effort. The proof is definitely in the pudding when it comes to hill sprints. I have been doing them 4-5 times a week for several months and am in the best shape I’ve been in since I stopped playing competitive soccer. No wonder they’re they were the preferred form of off-season conditioning of Hall Of Fame football players Jerry Rice and Walter Payton. In this article I give you all the information you’ll ever need to get in a great workout sprinting hills. Give them a try after reading it to see for yourself. The first thing you need to do is find a proper hill to run. When conducting your search, look for a hill that’s 30 yards or longer. It should be steep enough so that your legs are tired after walking it but not feel like they’re on fire. Make sure the surface of the hill you choose is pretty even to reduce the risk of twisting your ankle or otherwise hurting yourself by stepping into a hole or uneven patch of dirt. I recommend grass and sand over an asphalt hill since these surfaces are easier on your joints. If you cannot find a hill by driving around your neighborhood or asking friends don’t despair. I’ve found many great hills to sprint while traveling by searching on Google. Use keywords like ‘sledding hills’ and ‘landfills’ and you’re sure to find one that works. Once you’ve got a hill to run it’s time to get to work. Listed below are several tips to help you get in a great workout safely. Even if you’ve run hills before you’ll still find helpful information. 1. Warm-up before you sprint. Since hill sprints are incredibly demanding you need to prepare your body before beginning. The best ways to get your body ready are by doing light calisthenics. A few I like are: arm circles, body weight squats, high kicks, and jumping jacks. Burpees work well too. Do a few sets of each for 10-15 reps and you’ll be ready. You can also walk the hill once or twice to prepare yourself after doing these calisthenics to further prepare yourself. 2. Check your form. When sprinting hills proper technique is especially important. Below are a few things to keep in mind when you’re running hills. Keep your head up and eyes forward the entire time you’re sprinting. Your shoulders should be back and chest out. Pump your arms back and forth when sprinting. Don’t move them across your body as this wastes energy. Don’t squeeze your hands into fists. They should be lightly clasped or kept open. Lift your knees high and push off from the balls of your feet with every stride. 3. Now it’s time to sprint. Don’t go all out on your first sprint. Instead, run it at about 50-60% of your maximum effort. This will help you further prepare yourself for the work ahead. Increase your effort with each sprint so that the last 3-4 of your workout are an all out effort. If you’re just getting into working out you may want to do your first 3-5 at 50-60% effort and increase afterward. Your first workout should include 3-5 sprints total. Add 1-2 sprints each week until you are able to perform 15 per workout. Rest between 1-3 minutes between sprints and then walk back down the hill to prepare for the next. Decrease the time you rest as your fitness improves. Once you can perform 15 sprints with 30 seconds or less rest between each you should find a steeper or longer hill to use or find other ways to make them more challenging. See the Advanced Hill Sprinting Tips section of this article for ways to make your workout tougher. 4. Cool down post workout. Keep moving after your last sprint until your heart rate returns to normal. This is best done by walking around on flat ground for 5-10 minutes. You can then perform static stretches for the muscles of your upper and lower body if you like. The best time to sprint hills is shortly after you’re done lifting weights or on an off day. Either will enable you to get in a great workout. I don’t recommend doing them before you lift as this can really make your workout surface. Since the workouts are so demanding you may find that your performance in the weight room suffers a bit at first. My legs shook when squatting for a few workouts when I added them to my workouts. Don’t despair. After a couple of weeks your performance in the gym, on the hill, and otherwise will improve. Once you can do 15 sprints you’ll have achieved an extremely high level of fitness and be ready to take your workouts to the next level. When you feel you’re ready give some of these ideas a try. Only add one at a time to reduce the risk of injury or impeding your ability to recover between workouts. 1. Wear a weighted vest during your sprints. 3 Perform an exercise before each sprint. Burpees, kettlebell swings, lunges, push ups, and squats are great choices. 4. 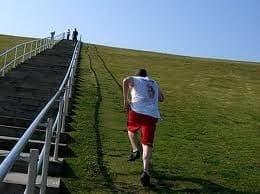 Perform a few sets of 1 or 2 legged hops up the hill before doing your sprints. Now you know perhaps the best way to improve your overall fitness level and rapidly burn off body fat. Another benefit you’ll find after doing them for a few weeks is that you’ll become mentally stronger too. Simply sprinting up a hill will make pushing yourself in all areas of your life easier. If you really want to lose fat fast, I recommend doing them along with this workout plan. Kettlebell Workout For Women – Burn Fat Fast!